This series of programs from Kultur Films presents an in-depth look at some of the greatest women artists of all times. It features spectacular imagery and many rare historical photographs. Primarily geared toward grades 7 and up. Mary Cassatt — Children and naturalism were the hallmarks of Cassatt’s work during the 1880s and 1890s. Her Impressionist colleagues included Caillebotte, Degas, and Renoir. Their influence, combined with her study of Japanese prints, helped Cassatt develop the modern idea that the background of a painting might be as significant as the foreground. In this educational program, Cassatt’s paintings are highlighted. It also features expert analysis of Cassatt's work and a biographical profile. 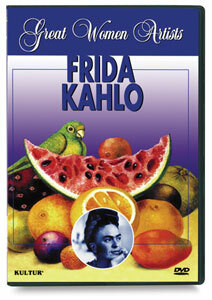 Frida Kahlo — This film examines the extraordinary life and Surrealist art of Kahlo, who began to paint in 1925 while recovering from a horrific streetcar accident that left her permanently disabled. Many of her 200 paintings directly relate to her experiences with physical pain and many also chronicle her turbulent relationship with artist Diego Rivera. Georgia O’Keeffe — This program examines O’Keeffe’s abstract, yet distinctly American, paintings. It includes information on O’Keeffe’s personal history and artistic career, with commentary from expert art historians and fascinating information about this unique artist.